Oahu arrivals from the U.S. West soared last month. 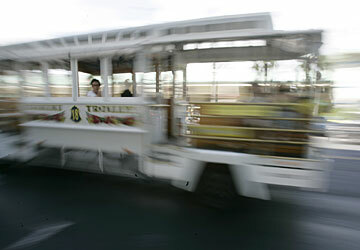 The Waikiki Trolley drives near Victoria Ward Center. GROWTH IN domestic visitor arrivals and strong increases from the Canadian snowbird market boosted Hawaii's visitor count 5.1 percent last month to a record 591,503 people from 562,763 a year earlier. Total visitor spending increased 6.8 percent, compared to October 2004, to $940.6 million, while total visitor days increased 6.2 percent, according to data released yesterday by the state Department of Business, Economic Development and Tourism. Average daily spending rose to $183 per person, compared with $182 in the same month last year. "We continue to be excited by the strong growth of Hawaii's visitor industry," said State Tourism Liaison Marsha Wienert. "As 2005 becomes the new benchmark year for the visitor industry, our focus must be on maintaining the strength and vitality of Hawaii's core economic driver." If the state's visitor industry is to continue growing, the private sector must continue efforts to improve accommodations and the government must invest in upgrades for the state's airports, harbors, parks and roads, Wienert said. Investment in marketing and infrastructure are the key to attracting higher-spending guests, which will help grow the visitor industry without further taxing resources, said David Carey, president and chief executive of Outrigger Hotels & Resorts. "When the hotels are running above 85 percent occupancy, there aren't that many more visitors that we can bring here," Carey said. "We need to find the intersection where the residents are proud to live here and the guests like to come here." Waikiki visitor numbers show proof that this concept works, Carey said. Visitor industry reinvestments in Waikiki as well as state, city and county improvements have helped rekindle interest in Oahu, he said. 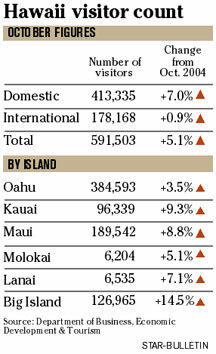 Visitor days on Oahu from the U.S. West were up 12.8 percent and arrivals were up 12.1 percent for October, Carey said. "That's very strong growth, especially for this time of year," he said. Fall is traditionally a softer season for tourism in Hawaii. The state's overall tourism industry got a significant boost as arrivals from the U.S. mainland rose 7 percent and arrivals from Canada grew 14.3 percent offsetting a decline from the Japan market. Pent-up demand and poor weather in other destinations like Mexico and the Caribbean contributed to a strong domestic market, said Ken Phillips of Pleasant Holidays, the state's largest wholesaler. "It was the worst weather season for the Caribbean and the gulf that they have ever had," Phillips said. "Cancun was knocked out and still remains partially inoperable and that will last for two to three more months." Into the holiday season, travelers can expect crowded conditions and few specials, Phillips said. "In years past, we would have seen plenty of trip promotions to keep the momentum up, but we weren't doing that plethora of business then," Phillips said. "The hotels don't need more business -- just better business. They want higher spending, more active visitors." Although the domestic market was booming in October, arrivals from foreign countries posted a scant 0.9 percent rise during the month because of a 4.9 percent drop in Japan visitor arrivals. Because of the high price of fuel, Japan Airlines and other carriers have had to cut back some flights to Hawaii, said Gilbert Kimura, sales director for JAL in Hawaii. Honolulu's only daily flight from Fukuoka as well one of the daily flights that runs from Osaka to Oahu were cut in October. A lack of available hotel rooms has contributed to the decline, Kimura said. However, he expects the market to improve. "Hawaii is still a very popular destination with the Japanese," Kimura said. The increasing price of hotel rooms in Hawaii is worrisome to Canadians, said Don and Terry Leier of Calgary, Alberta, who were making their fifth or sixth trip to the islands last week. "A lot of Canadians are going away this winter, but many of them will go to Mexico," said Terry Leier. However, this season's more favorable exchange rates could contribute to an increase in travel to Hawaii from this market, they said. "It's more economical to come now and we took that into consideration," Don Leier said.